I was back with the Apple Chevrolet team for the 2001 season. I had raced for and with these guys for several years now so I knew what they were capable of. The season started in Florida for the All-Star Winternationals. 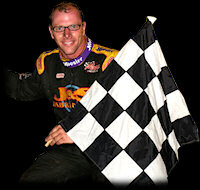 We won our first race at East Bay Raceway on February 16th. We would eventually go on to win 4 more features this year, despite a mid-season crash at Williams Grove Speedway that kept us out for several weeks. The team would record 47 Top-10 finishes with 26 in the Top-5. The Apple team also set new one-lap records at Grandview Speedway and Delaware International Speedway. The 2000 season was sure to be an exciting one for me. I was with a brand new team and had Guy Forbrook, one of the top wrenches, as crew chief and car owner. However, a crash during the spring show at Granite City changed that. A shoulder injury kept me out of competition for 4 weeks. The team faced many obstacles during the season. Despite 32 engine changes, we recorded 18 Top-10 finishes with 6 in the Top-5 and had 40 "A" main starts. Preliminary night feature wins at Texas Motor Speedway and Hagerstown Speedway helped us to finish 15th overall in the World of Outlaws point standings. I need to thank the following sponsors: Wirtgen America, Jimmy Vasser Chevrolet, Goodyear Tires, Jackpot Junction Casino, Kele OEM and Energy Release for their support. I left the Selma Shell team right before the Knoxville Nationals to race with Apple Motorsports of York, Pennsylvania. Won 20% of races entered, including Selinsgrove Speedway, Sharon Nationals, Port Royal Speedway, Tuscarora 50, Williams Grove Speedway and Selinsgrove National Open. Two track qualifying records at Grandview Speedway and Selinsgrove Speedway. In 1999, we entered 97 races and won 12 features including the Mopar Clash at Eldora Speedway and an All-Star win at Sharon Speedway. We ended up with 15-2 nd place finishes and 7-3 rd places. We also had several Fast Time Qualification awards and set a new track record at Sharon Speedway. I began the 1998 season with Selma Shell, but left the team right before the Knoxville Nationals. During this time, I set two track qualifying records, one at Beaver Dam Raceway in Beaver Dam, Wisconsin and the other at Tri-State Speedway in Haubstadt, Indiana. Of the races entered, I finished 8% in the Top-5 and 35% in the Top-10. In December of 1995, Dave Helm and Sonny Kratzer, the owner and crew chief of the California based Selma Shell Racing Team, invited me to become a part of their program. They were looking to evolve their racing program from local California competition, NARC competition, and All-Star competition, to full time World of Outlaws competition. They knew that I was still evolving as a driver, as well. Logic was, that over time, we could grow together into a serious competitor on the World of Outlaws circuit. We expected 1996 to be a year of adjusting, not only to each other but also to working with a different chassis and motor. We did not expect to have one of the worst seasons that either the team or myself had ever had. We really struggled in World of Outlaws competition, our best finish being seventh place. We started the All-Star Circuit of Champions season in Florida, without success. Out of 9 nights of racing, we recorded one Top-5. We then went back to California with the NARC series, winning two out of the first six NARC races, but still struggled to get up to speed. We then headed East to compete with the All-Stars, World of Outlaws, and Pennsylvania Posse, struggling most of the time with qualifying and finishing races. Toward the end of the season we found a few combinations that seemed to help us gain speed, slowly but surely. Even though our finishes weren't showing it, the team was coming together. We ended the season on a high note by winning our last race, the Cotton Classic at Kings Speedway. In 1996 we competed in 101 total races. They consisted of 71 races with the World of Outlaws, 15 with the All-Stars, and 15 non-sanctioned events. We finished 84% of the races. Out of those we did finish, we won 3%, 6% were in the Top-5 and 37% were in the Top-10. Again, this was much worse than we had all expected, but at seasons end, our evolving team was headed in the right direction. We were ready to tackle a full season with the World of Outlaws. The 1997 season was my best year in World of Outlaw competition. After the first 9 races we had 3 Top-5's and 7 Top-10's. This was definitely an improvement over 1996. We consistently finished in and around the Top-5, running in the Top-5 in points until July. The pinnacle of our season came in August at Knoxville Nationals time. We finished 2nd at the Nationals, won the next race at Sweetwater Speedway, and ran second a week later at Riverside Speedway. We ran 99 races in 1997, completing 90% of them. Out of those we finished, 1% were wins, 28% were Top-5's and 72% were Top-10's. We finished 7th overall in World of Outlaw points, earning over $220,000 in race winnings. This was such an improvement over 1996, that I received the inaugural World of Outlaws MBNA "Most Improved Driver" award. Our team was also rewarded with the VIVARIN / Nicoderm CQ sponsorship left vacant by Dave Blaney's move to NASCAR. It was great working with the Two Winners' organization. The owners, Tom & Kay Wimmer and Bob & Sammy Kramer, were especially nice to me. Our sponsor was Kele. During the two years I was on the Two Winners team, I had my first WoO victory, numerous "Hard Charger" awards and a track record at Ransomville Speedway. I also had many exciting and competitive runs, including the 1994 Knoxville Nationals where we won the Non-qualifiers race, charged through the "C" and "B" then passed 18 cars to finish 5th in the "A" feature. For the first year and a half, our crew chief was Robert Hubbard, later replaced by Glenn Stewart. J.C. Bayless was our mechanic the entire 2 years, and the TW Racing team manager was Scott Benic. In 1994, Two Winners Racing included three teams: the 7TW, driven by Jeff Swindell, the 9TW driven by Joe Gaerte, and the 8TW driven by myself. It was a learning experience being around Jeff and Joe. Each had a good understanding about driving, set-ups, and motors. I learned a lot about racing from these guys. Toward the end of 1994, Robert Hubbard and I had grown to know each other better. We had a really good Knoxville Nationals. Out of the last 16 races, 14 were in the Top-10 and 6 were in the Top-5, including the prestigious Williams Grove National Open. In 1994, we competed in 91 races finishing 87%. Out of those we finished, 16% were in the Top-5 and 49% were in the Top-10. Momentum was definitely on our side for the beginning of 1995. We had the same cars, the same motors, the same crew, but our team was short one car. Joe Gaerte left the Two Winners organization to drive for Al Hamilton. That left Jeff Swindell still driving the 7TW and myself in the 8TW. This may not sound like a big deal, but Joe was an instrumental part of our motor program in 1994. We definitely lost an asset when Joe decided to leave. After racing the 1994 winter in Australia, I came back to the WoO in stride. After the first 9 races, we were running 3rd in WoO points. We had recorded all Top-10 finishes with 4 in the Top-5 and I won my first Pennzoil World of Outlaws "A" feature at Battleground Speedway on March 24. At this point we had only completed about 10% of the races, but it sure sounds impressive. Unfortunately, we started falling out of races with a few motor problems and a few crashes. This took us out of the points race. In July, my crew chief, Robert Hubbard, was let go and replaced by Glenn Stewart. Both Robert and Glenn are great crew chiefs, but the bond that Robert and I had formed after nearly a full season together was broke and I had to start all over again. We ran 98 races in 1995, completing only 78% of them. Out of those races we did finish, 19% were in the Top-5 and 86% were in the Top-10. Winner's team had improved, but it was not enough to attract the additional sponsorships needed for the organization to continue to race two cars. At season's end, Bob, Tom and myself realized that to run another season and to do it correctly, was going to take a financial commitment that could not be met. Consequently, it was an end to a very special relationship between my owners and my teammates. They were all great to work for and with. 1993 World of Outlaws "Rookie of the Year"
This was a very consistent car and I gained a lot of experience with it. It was owned by Hodnett Motorsports and sponsored by Kele. Our crew chief was Mike Cool. "Cooly" did a great job. He and French Grimes handled the fueling details with the motor. Two of our motors were handled by Gaerte Engines, one by Wesmar and Danny's Engines rebuilt a few. Mike was a great help and very patient with me. He really listened to what I was trying to say and made decisions on the set-up accordingly. I'm a quiet person and not a great communicator, so Mike's patience, persistence, and attention to detail really helped. Our inaugural World of Outlaw's (WoO) season was a grueling experience. Looking back, I think I made life more difficult than it should have been. For example, at 23 years old, I had raced a total of 250 times, just graduated from college, never run a series before (let alone the toughest in the world), and it was now my responsibility to make decisions about hiring, firing, hotel reservations, ordering parts, scheduling motor rebuilds and tire purchases, keeping the books, writing checks for payroll, fuel taxes and bills, budgeting our expenses for the year, helping Mike maintain the car and drive the hauler. And, of course, drive the car! Boy was I green! Mike and I were the only crew for the first half of the year. Because of financial constraints, we couldn't afford any help, or at least I thought we couldn't. In July, I hired crew member Jason Voelkel, and believe me, it was worth the extra expense. With all of these decisions to make, I definitely made some bad ones. I guess you just have to live and learn. We finished the first 32 races of the season with no mechanical failures or crashes. We ran the first motor 21 times before we had it rebuilt. I was just trying to get laps, stay out of trouble, try to mature as a driver and a person, and spend as little money doing it, as possible. Overall, our first season on the WoO tour was not a total disappointment. We didn't win any races, as a matter of fact, we didn't even run in the Top-5, but I gained valuable experience, both as a driver and as a person. We ran 76 races finishing 92% of them. We finished 25% of them in the Top-10 and 68% in the Top-15. We ran 12th at the Knoxville Nationals, 6th at the Syracuse Mile, and 7th from the rear at the Kings Royal. We ran 7th overall in World of Outlaws points, earned the World of Outlaws "Rookie of the Year" title, and most importantly, we finished the entire season without running out of money. This car was very fast! It was the first winged car that I drove. It still holds the limited sprint track record at the Memphis Motorsports Park (MMP), along with the 1987 and 1988 MMP Track Championships. My dad was the crew chief, and the crew consisted of our family and friends. Everyone on the team had "real jobs," so we would work on the car in the evening after my dad's shop, Mid-South Forklift Service, Inc., closed. Dad told us what to do to the car and if it didn't get done, we didn't race. His one rule was: stay out of trouble, act responsibly, make good grades, work on the race car and then you can race. And race we did. Going from running a non-winged car at West Memphis, to running a winged car on a big half-mile track was quite an adjustment, but I loved it. Running wide open, keeping the car straight and smooth was all I ever wanted to do. Having a nice handling race car, made my life as a developing driver, a lot easier. In 1987 we competed in 33 races, finishing in 79%. We won 47% and ran in the Top-5 in 73%. In 1988, we competed in 24 races, finishing 96%, winning 31% and running in the Top-5 in 62% of the races we finished. This was an exciting period of my life. I graduated high school in May, 1987 and started college at the University of Memphis that fall. All the while, we raced on the weekends and worked on the car during the week, but only after 5pm when the Mid-South Forklift Service had closed. Of course, these hours put a real damper on any type of social life. Somehow, I found some time to date a good friend that lived 1/4 mile down the road from my family. Laura Hess was a friend throughout grade school, junior high, and high school. Ten years later I changed her name to Laura Hess Hodnett. 1986 - Modified Sportsman "B-Car"
This car and the team involved with it were very special to me. It was the first race car, of any kind, I drove. My team consisted of family and friends. This was where it all started. My racing career began at the end of 1986. Friday nights I raced at Cottonbowl Speedway in Byhalia, MS and Saturday nights I raced at Riverside Speedway in West Memphis, AR. The team was started by a close friend of our family, Clayton Allen. Clay originally bought this car to drive for himself. He asked my father, Hoyette Hodnett, Jr. to help with advice on purchases, organization, and general supervision. When my father agreed to help Clay, my involvement in racing began. As we began work on the car, my dad had one condition for myself and Clay. We both had to agree to work on and understand fully how a sprint car was put together and how it works, before we were allowed to drive. This meant Clay and I had to do some work before we could drive, so we enlisted the services of a very talented driver from Memphis - Mike Ward. Mike won 83 out of 86 total races in this car before I started driving it. You're probably wondering what happened to Clay? Well, Clay raced in a heat on the last race of the 1985 season. On the start of the heat, someone hit the front end of the car and put him into the front stretch wall, destroying the car. Clay didn't have enough money to put it back together. In order for us to continue to race, my dad decided to piece it back together again. Meanwhile, Mike was doing such a great job driving for us, I never really expected to get an opportunity to drive. Fortunately for me, others saw Mike's talent. He was contacted by Mr. Stan Schoff, and was asked to drive the #23s, in Illinois. When Mike went away to further his career, my career started. In my first heat at Riverside Speedway, I didn't have a clue as to what I was doing. I finished 6th in the heat. After the heat, my dad said, "It's not going to do you any good to be mad. You'd better figure out how to get the car around the corner. Remember, these cars are built to be driven fast and driven hard. The faster you go, the better they feel." Well, my dad was right, and he usually is. We started 11th and ran second. We would have won if I hadn't run into the leader. I won the next several races, but I also crashed a few. We had a lot of fun with my first car. It was always fast, no matter who drove it. This car changed my life forever. It kept me out of trouble during my adolescent years, it bonded my family and my friends, it brought a new found confidence to our entire team, and it showed me that what I really love to do was race.